Lamborghini style doors (or scissor doors) aren’t for everyone. They might look cool on a Lamborghini but on budget hatchback and sedans, they are a misfit. But let’s keep that opinion aside and look at a bunch of modified examples, and decide for ourselves. When BMW took over MINI back in the day, they won’t have thought that an India-made version will be available at a fraction of a price. It turns out a MINI fan was closely following the design evolution and applied all that he learned to his beloved — or maybe not so beloved — Swift. To throw authenticity out of the window, he she used similar-looking head- and tail-lamps, radiator grille, and even the MINI moniker. 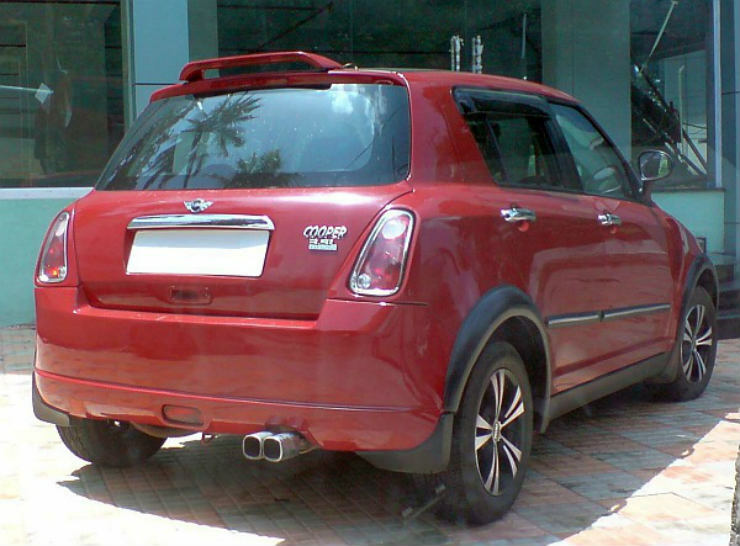 Complete with ‘Cooper’ badging, the car is as close as you can get to an impoverished MINI. The Maruti 800 is a legend. Its small footprint and a rather-peppy engine make it a good pocket rocket. Needless to say, some styling upgrades must be included to make it survive the modern day car buyer’s needs. And voila! Someone has done just that. And while doing so, the modifier removed the rear doors, made the glasshouse appear larger, added new head- and tail-lamps — former off the Accent, latter from the Polo — and personal touches like a new boot appliqué, etc. 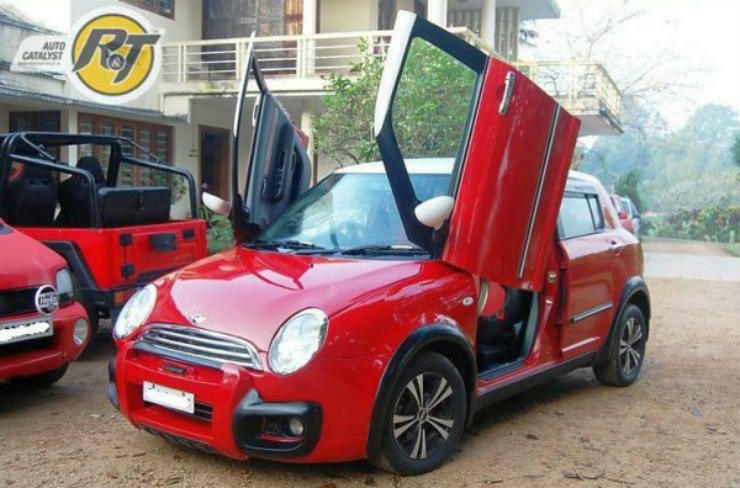 The whole thing was on the verge of being termed acceptable until a brilliant mind came up with the idea of adding scissor doors to it. Now it just looks ugly. The ‘Josh’ machine was a really capable machine, offering enough grunt and handling prowess to keep the one behind the wheel happy and er, josh-ful. But one of the tuners thought the old yet perfectly functional and good-looking doors made the car look bad, and hence put a pair of upwards-opening flaps of disaster. The blind-spot-creating oversized rev-counter seems to be a figment of his/her design marvel, too. 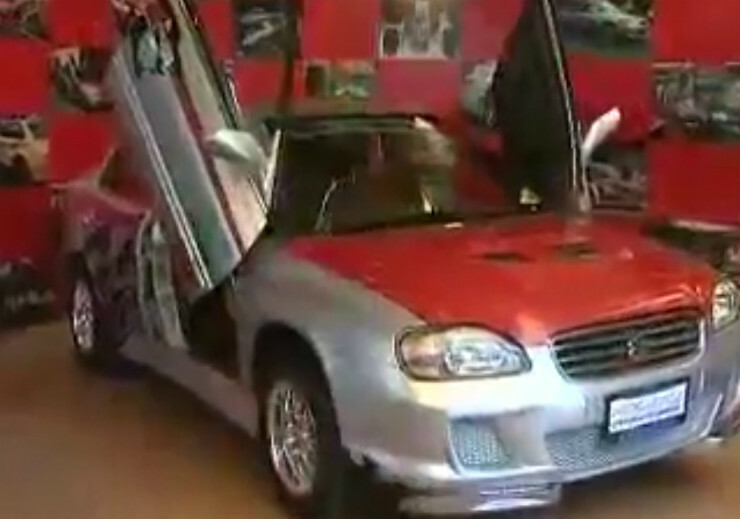 Long ago when someone tried to recreate Pimp My Ride on Indian telly, there must have not been a lot of cars to let their ‘designer’ play with. 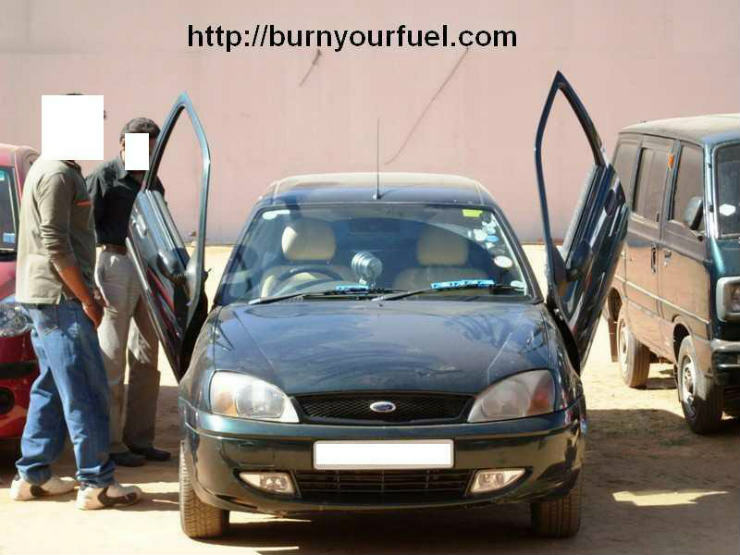 And hence the poor Maruti Suzuki Baleno was chosen for the job. And as wonderfully described by autoevolution’s, the car looked nothing short of a disappointment once it was ‘pimped’. Why, you must ask. 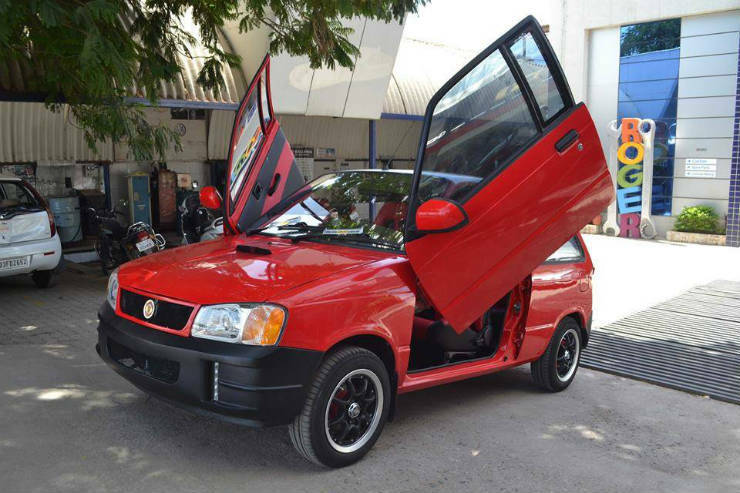 Well, to start with, it had a hideous body kit, a paint that looked more like red-oxide treatment on aluminium, and of course, Lamborghini-style doors. Poor Baleno! So you’ve got one of the best JDM cars of its time — something that has a great potential to be modified — and a couple of lakhs of daddy’s money to splurge on it. What do you do? Well, making it uglier can be a good start, don’t you think? 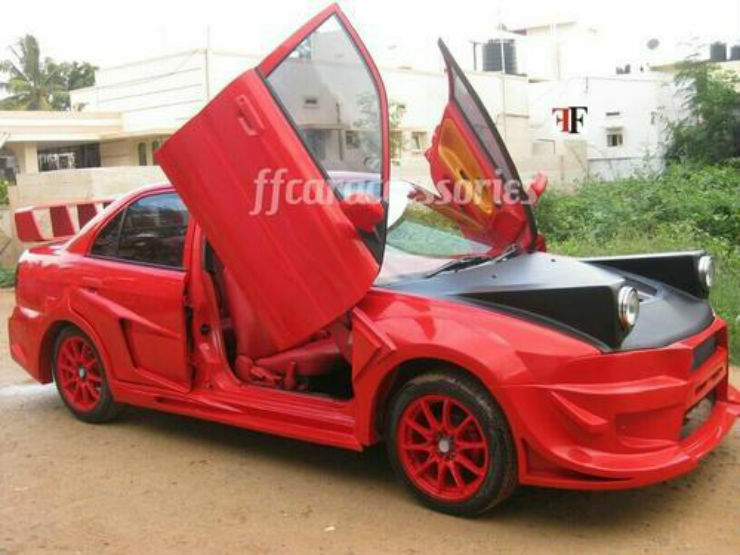 A brilliant design was ruined in the making of this edgy non-sense, and the scissor doors just add to that. 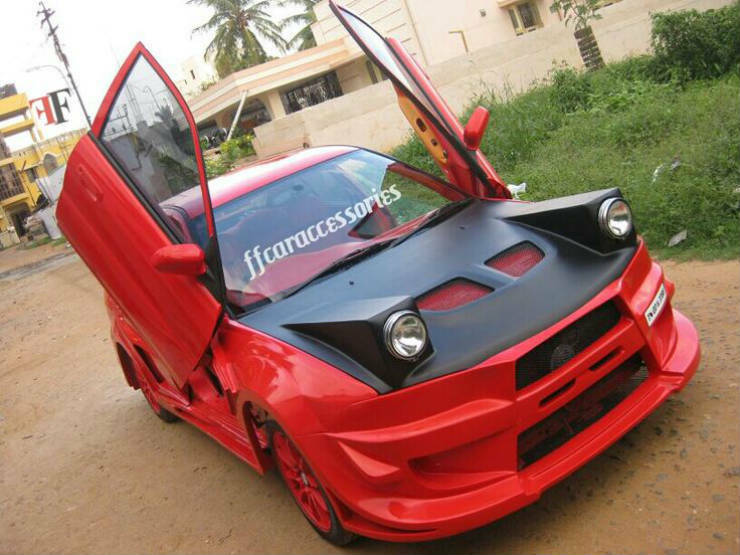 But the said doors aren’t as important as the circular, almost ‘pop-up’ headlamps, badly shaped bodykit, and of course, the ‘sporty’ paintjob. We’ll pass.